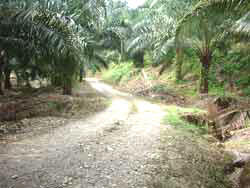 The land is just before Sang Lee village and also before Tan & Tan's Bentong Hill and beside Bentong Oil Palm Estate (same side). This is a common road used by all the small holders at the back of this Bentong Estate. The subject property is about 1.5 km off the main road. On reaching the land, one must use a 4-wheel-drive to drive up to the top of the land. 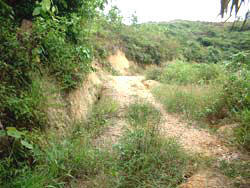 Shown here is the laterite road on the land. Part of the road is well maintained while part of it needs upgrading. Overall the gradient of the internal road is not steep. One portion of the land is steep as can be seen from here. 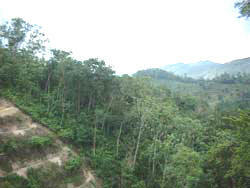 However, the land is well kept with well maintained terraces except for some part of the land. 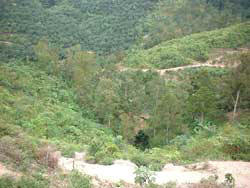 Beyond the rubber trees, a few lots away is Tan & Tan's Bentong hill development which is lower than this land. The view from the top of the land towards the bottom of the hill. Right at the bottom is a durian plantation with a stream. Part of the water from the stream come from the spring water oozing out from the subject property. The land has been terraced but part of the terrace here are overgrown with bushes.